Cyrus One review | What Hi-Fi? Few things are more certain in life than death, taxes and Cyrus' consistency with making good stereo amplifiers. Keeping up that tradition is the One. Paying homage to the brand’s debut amplifier, the Cyrus 1, which helped launch the company in the mid-1980s, it features its latest-gen Class D amplification. In an attempt to appeal to a younger crowd, the design team has gone off-piste. This model retains the compact footprint of every other amp in Cyrus’ arsenal, but its aesthetics are much more contemporary. And, dare we say, exotic. Instead of the retro buttons and display screen on the typically Cyrus amp, this one has bright LED lights that circle the matte black volume and source selection dials, which dominate a front panel that’s glossy and slightly protruded. It takes getting used to, but it’s love on second sight, even if the build quality doesn’t appear up to Cyrus’ typically high standards – in our time with it, one of the feet came away from the unit. Sadly that can’t be said for the puny credit-card style remote, although thankfully for existing Cyrus owners, the amp should work with other Cyrus product remotes. We wish the amp's casing felt less like an empty biscuit tin, too. The new Cyrus One may be named after a product that launched 33 years ago, but the specs have been brought right up to date. While there’s no DAC, aptX Bluetooth is onboard so you can stream music from a phone, tablet or laptop. 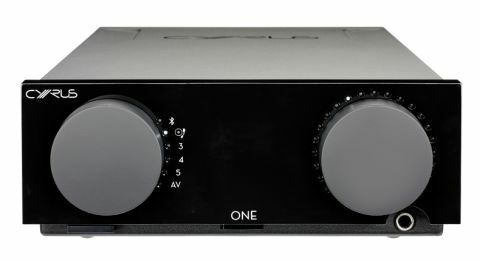 On the analogue front, there’s four line-level inputs – one of which is has an AV bypass mode so it can double as a power amplifier in a home cinema set-up – a moving-magnet phono stage for connecting a turntable, and a 6.3mm headphone and pre-amp output. The keener-eyed will notice the absence of obvious heat sinks, thanks to the use of efficient Class D technology. Take a look inside and you may notice the use of thicker tracks on the circuit board, and that’s one of many tricks Cyrus has implemented here in the name of better sound quality. To reduce unwanted noise, signal paths have been shortened, and because the Bluetooth receiver sits near the front panel away from the components so as to facilitate maximum Bluetooth range. The signal path connecting the module to the pre-amp stage is balanced to aid performance. Also, the brief light display each time it powers up isn’t just the amplifier making a glitzy entrance but denotes something Cyrus calls SID (speaker impedance detection), a process in which the Cyrus measures the impedance of the connected speakers and adjusts its output response accordingly. One of the weaknesses of Class D designs is their variable sound with different speakers. This process optimises the amp's sound with the connected speakers. Brands as consistent as Cyrus often have a specific sonic signature, but unusually for a Cyrus product review we aren’t starting off this section by using the words ‘fast’, ‘dynamic’ and ‘rhythmic’. The One surprises yet again, delivering a big, glossy and clinically-balanced presentation that’s lathered with the punch and solidity that makes music, whether it’s SBTRKT’s Wildfire or Olaf Arnalds’ Ljosio, sound immediately arresting. Cyrus claims a power output of 100 watts per channel and that figure is believable. The drums opening the former snap through our speakers with force and duress, and the chubby bassline is backed with plenty of weight as it moves at pace over the top. The silky pop vocal penetrates the soundstage with just as much conviction and is fleshed out without sounding too thick or sacrificing texture. It's not flawless, though. A lack of spatial awareness and dynamic subtlety can make the labyrinthine track seem a little congested, and the better-timed Rega Elex-R gives it a masterclass in capturing the rhythmic wonkiness. Switch to the Arnalds track and although the Cyrus gets across the deliberate hardness of the violin as it zeniths, without tipping it into feeling harsh or strained, it struggles to communicate the low-level dynamics of the strokes. Without that variation and subtlety, the One isn’t quite a superstar. Still, record revivalists will be pleased to know that the phono stage will only encourage the vinyl-collecting habit. The Tallest Man On Earth’s Singers is a bold, insightful listen, with vocals, guitars and strings all clear and tactile. To be honest we could repeat ourselves there to describe its Bluetooth presentation, which is characteristically on-point, albeit expectedly less transparent and refined than its wired sound. If you struggle to establish a pairing with your device, as we did, initiating a factory reset by pressing the mute button on the remote five times within ten seconds of switch on should do the trick. When headphones are plugged in, it’s believable that the power supply disconnects from the main amplifier and dedicates itself solely to the headphone one; the sound is powerful, well driven and tonally consistent. At £700, the One is currently Cyrus’s most affordable stereo amplifier, and while not the complete product in the sound compartment, it’s an attractive bundle of performance, features and design. Looking for an affordable and fuss-free amplifier with Bluetooth? Here’s the One.